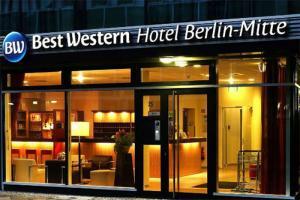 Soak in the culture and history of Berlin at the Best Western Hotel Berlin-Mitte. The bustling Friedrichstrasse neighborhood, 17th-century Brandenburg Gate, and Museum Island complex are within walking distance of the hotel. The hotel's friendly multi-lingual staff offer a warm welcome and attentive service. Comfortable guest rooms include cable or satellite TV, free Wi-Fi, data ports, 24-hour room service. Relax in the welcoming cocktail lounge, which screens live sports.